Contemporary global food systems are complex, dynamic, rapidly adaptive, and intertwined—operating well outside every historical precedent. This condition has developed relatively quickly, outpacing both conventional statistical representations, and, likely, traditional strategies to mitigate large scale vulnerabilities. 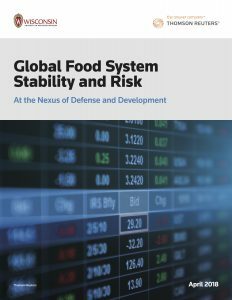 The introduction of the conceptual frame of “food systems,” a term applied from global to very local scales, has been a crucial advance resulting from post–9/11 applications of more sophisticated approaches to supply chain integrity and cybersecurity. This paper reviews the opportunities afforded in a world awash with real-time and near real-time data to better reflect and inform the ways in which both risks and opportunities in our food systems are managed. Driven by both traditional and gray zone conflict across a wide spectrum of intensity and stresses, 2017 saw one of the worst years for famine since World War II, and also one of the largest human migrations in the history of humanity. These trends set the stage for novel approaches to identify opportunities using familiar and new data and visualization techniques to illuminate and scrutinize major vulnerabilities that cut across many traditional boundaries toward securing more stable food systems, and therefore more peaceful, equitable and prosperous futures for all. See this link for a Thomson Reuters blog post summarizing this work and its consequences.